These Sign Supplies Make Sign Making Easy! These Sign Making Supplies are Wholesale Must Haves! Wholesale Sign Supplies Online Here! 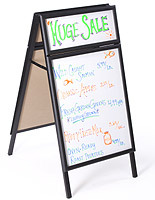 24" x 28" white board for detailed messages and images below the header. Solid oak wood frame matches many indoor and outdoor environments. 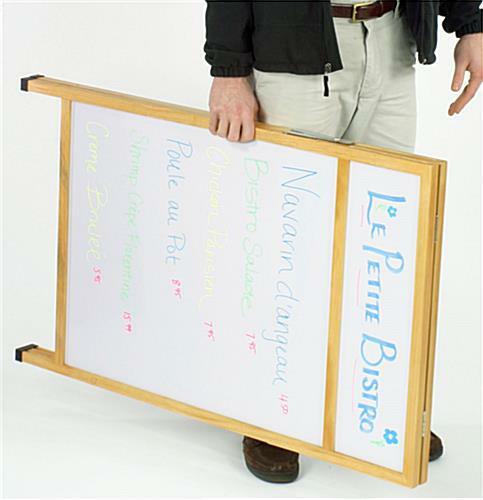 These sign supplies are a the perfect tool to entice customers into your store or restaurant! 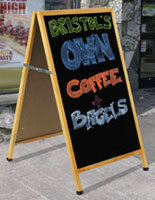 Sign supplies such as these sidewalk signs are often seen in front of bars, nightclubs, restaurants, and retail stores. Each sign supply is made of solid wood in an attractive natural finish making it ideal for every color scheme. 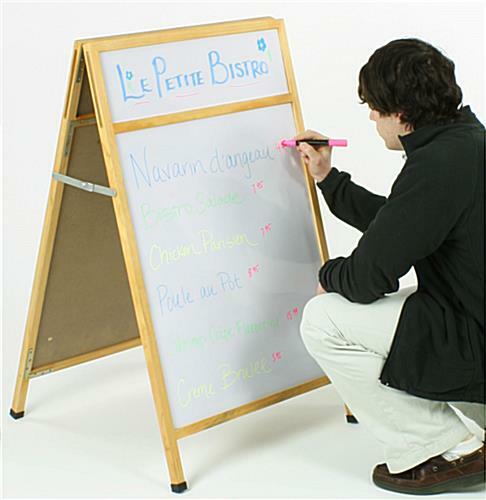 The writing surfaces of these sign supplies are white boards engineered for use with wet-erase markers or liquid chalk. 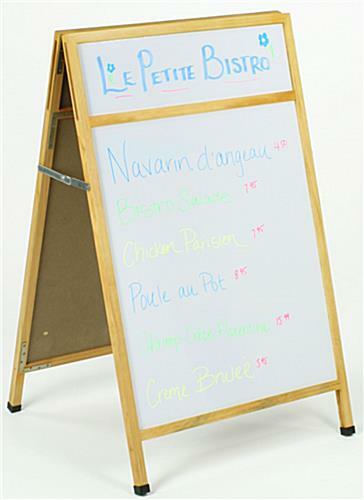 Wet-erase markers leave a more durable image on the signboard and require a damp cloth for removal. The header area ensures your business name will be highlighted so there is no question as to who is doing the advertising. The header may be hand-written with wet-erase markers or, because of the slide out design, may be a custom printed sign that is inserted into the header area. 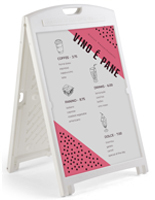 These sign supplies are excellent advertising tools and help every business promote daily specials, special events, store hours, and other important information. 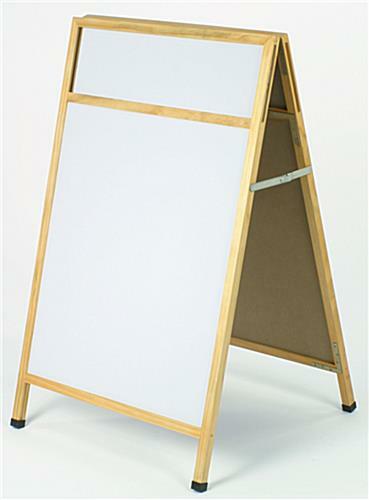 These sign supplies, A-frame displays, are constructed of solid oak with a white marker board. These sign supplies are part of our low-cost economy selection. 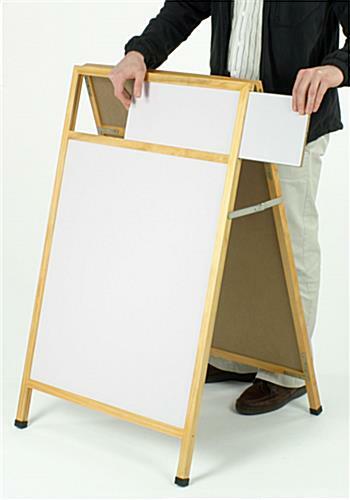 These space-saving sign supplies make sign making easy! Simply write and erase! Buy affordable wood sign supplies online today! Why Choose These Economy sign supplies? 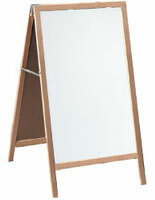 With these sign supplies, the white board surface is a wood-substrate, and is meant primarily for indoor use. The marker board can be used outdoors, however, we recommend bringing it inside during inclement weather. As with other wood-based products, the wood expands and contracts in different weather conditions. This may cause "checks" or imperfections in the wood. The "checks" in the wood are not noticeable from a distance, and with our affordable pricing, you won't find any other write-on boards that can compare. 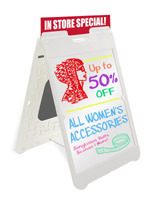 In addition, these sign supplies are intended for use with our neon wet-erase and liquid chalk markers. They are not intended for use with dry-erase markers, as these will leave a residue. 25.5" x 42.0" x 26.0"